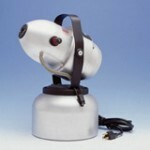 PRODUCT DESCRIPTION: Electric fogging machine which converts either water or oil based formulations into a fine mist. This mist will be hard to see since the particle size is true ULV with an average range of 7-30 micron particle size. 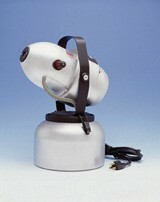 ULV is a special type mist or fog which is comprised primarily of particles which are very small. These single digit micron sized particles work better on flying insects and stay suspended longer compared to larger based aerosols which standard mist blowers like the FM6309 or FM6208. It can be used to fog water or oil based sprays and will work with any ready to use formulation or concentrate. Well suited for environments where minimal residue is preferred, the FM7401 is one of the best cold ULV electric foggers on the market. RATE OF APPLICATION: These machines are adjustable up to a couple of ounces a minute. However, don't expect to get any type of heavy flow as you can from our other machines. These machines are low rate applicators which make it hard to even see the material as it is dispersed since the particles are true ULV.